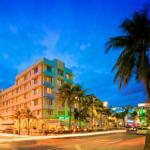 The hotel was located on Ocean Drive, the most popular strip in South Beach. It was the art deco style and the beach was just across the street. The weekends in South Beach are quite lively and loud, so be prepared for that. Rooms were a bit small and outdated. The Winterhaven Hotel, a twenty-minute drive from the Miami International Airport, is within walking distance of chic South Beachs nightclubs, cafes and shops. Coral Gables, Coconut Grove, Port of Miami and downtown Miami business district are minutes away from the property. Highlights of the hotel are art deco interiors, spacious spectacular lobby, multi-level mezzanine, etched glass recessed wall panels, the Chinese mirrored panels, huge veranda facing the Atlantic Ocean and magnificent views of the ocean from guest rooms. Concierge, valet parking, same day laundry and shoe shine services are also offered for the comfort and convenience of the guests. All accommodations are equipped with 27-inch cable televisions, irons, ironing boards, Bath & Body Works toiletries, two line telephones with voice mail and data port, safes and clock radios. Two- and one-bedroom oceanfront suites feature parlors and bedrooms. The Corner Oceanfront View Rooms are ideal for families and group travelers. For private parties and meetings, the hotel has an airy sunny multi-level mezzanine. The hotel has wireless high-speed Internet for entertainment and communication; full-service stylish Martini bar for drinks; continental breakfast, consisting of tea, coffee, orange juice and pastries; and audio visual equipment for meetings. The hotel offers discount passes for gym. You would love panoramic views of South Beach from the rooftop sundeck. This centrally located hotel has everything for an enjoyable stay. Most of the guests were happy with renovated comfy rooms, price, accommodating staff, location, deck, free drink tickets and breakfast, wireless Internet and views. However, a few guests griped about small rooms, worn out carpets and plumbing problems in dirty bathrooms.